DAN: That’s interesting that you say that you fish singles a lot, is that throughout the year too? SCOTT: I like doing things that others are not and that’s something that you rarely see anyone do. Some people are afraid of it, but with wise old fish they know that if they stay in an area pigging out on bait for too long, there is a good chance that they will get caught. However, if they have a little mouthful and move on, they don’t tend to get caught a lot. With a single you are not giving them any chance of missing the bait. If you have something that they want, an effective rig and a sharp hook there is a high chance of catching one. DAN: Would you class yourself as a riggy person, or would you just fish something very basic? I don’t have many rigs that I use, but I use certain ones for different lakes. If I was fishing this lake, I have a bottom bait rig that I have used for years but it works really well. It’s a pain in the arse to tie, so I think a lot of people wouldn’t use it, which is why I think it works so well. So yeah, I guess I do think about rigs a lot, I suppose you have to if you want to try and catch carp that have seen it all in the past. 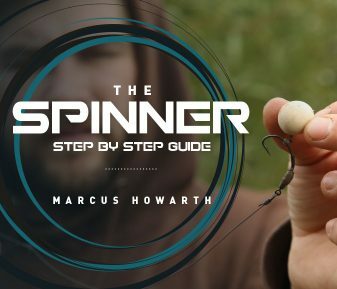 If I am going somewhere that the fish are not overly pressured, then rigs like the hinged stiff are perfect, as they are simple to tie, always fishing and give you great hook holds. 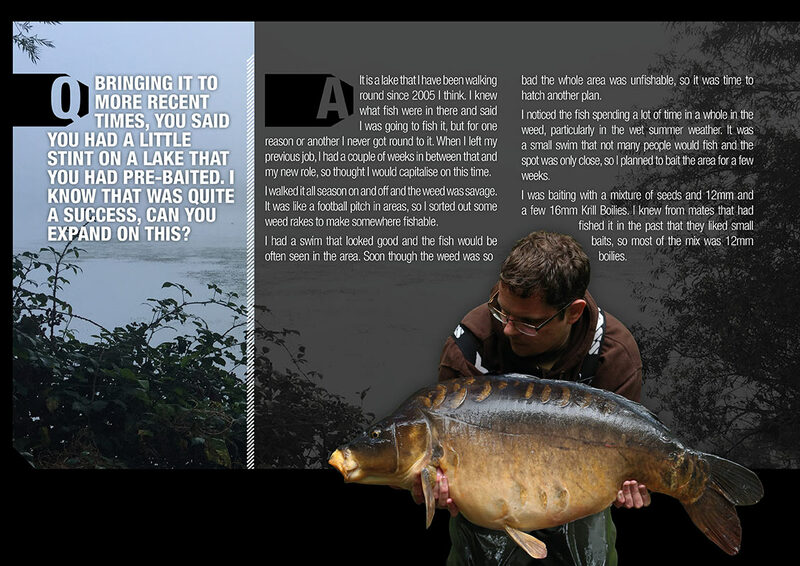 But on lakes that have been fished heavily, I am sure a lot of the fish have learned by association and hooking them on rigs that they have been caught on time and time again can be hard. 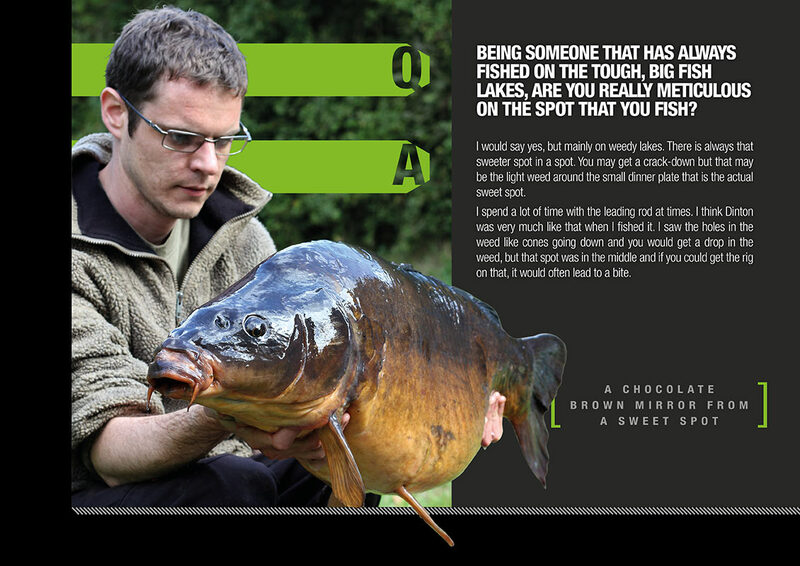 I had a break from fishing this lake for a few years and when I came back I struggled. It wasn’t until I conjured up all the old components to a rig I used successfully before that I started catching again, from that first session using it in fact. I then caught two the following week and my confidence was sky high. I remember telling everyone at work that week that I was going to catch another one that weekend. Sure enough I caught one of the big commons and I was sure that it was the rig that helped me to achieve that. DAN: You have referenced ‘here’ quite a bit. 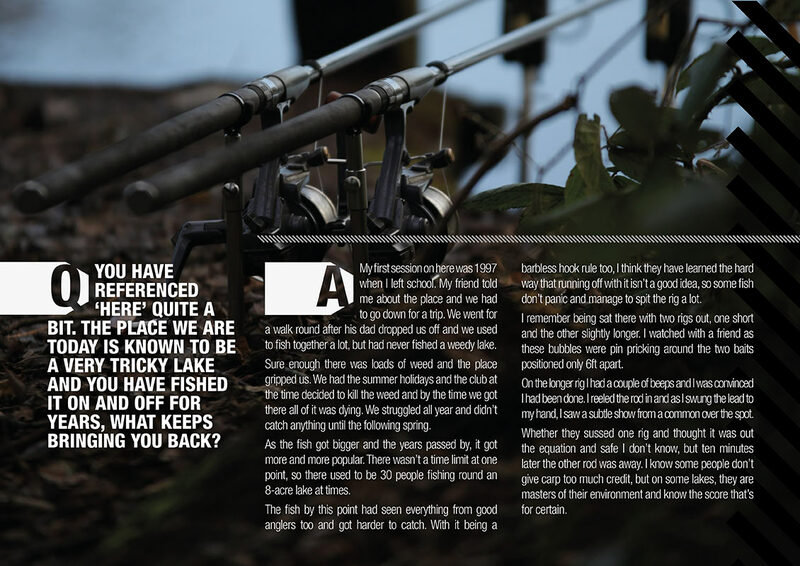 The place we are today is known to be a very tricky lake and you have fished it on and off for years, what keeps bringing you back? SCOTT: My first session on here was 1997 when I left school. My friend told me about the place and we had to go down for a trip. We went for a walk round after his dad dropped us off and we used to fish together a lot, but had never fished a weedy lake. Sure enough there was loads of weed and the place gripped us. We had the summer holidays and the club at the time decided to kill the weed and by the time we got there all of it was dying. 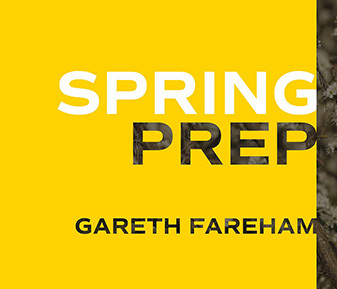 We struggled all year and didn’t catch anything until the following spring. As the fish got bigger and the years passed by, it got more and more popular. There wasn’t a time limit at one point, so there used to be 30 people fishing round an 8-acre lake at times. The fish by this point had seen everything from good anglers too and got harder to catch. With it being a barbless hook rule too, I think they have learned the hard way that running off with it isn’t a good idea, so some fish don’t panic and manage to spit the rig a lot. 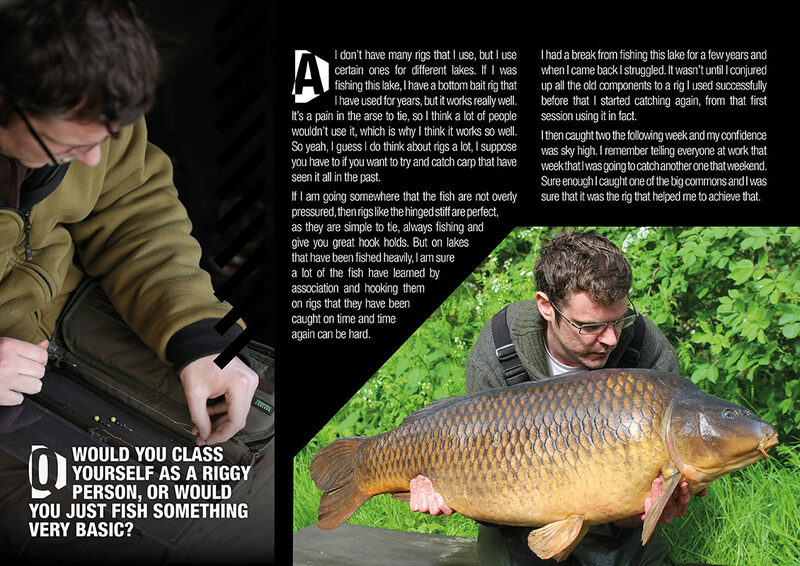 I remember being sat there with two rigs out, one short and the other slightly longer. I watched with a friend as these bubbles were pin pricking around the two baits positioned only 6ft apart. On the longer rig I had a couple of beeps and I was convinced I had been done. I reeled the rod in and as I swung the lead to my hand, I saw a subtle show from a common over the spot. Whether they sussed one rig and thought it was out the equation and safe I don’t know, but ten minutes later the other rod was away. 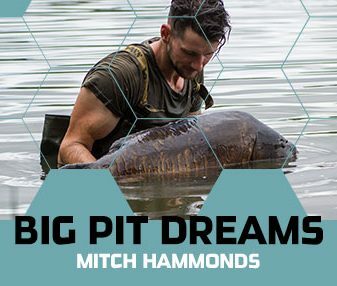 I know some people don’t give carp too much credit, but on some lakes, they are masters of their environment and know the score that’s for certain. DAN: Being someone that has always fished on the tough, big fish lakes, are you really meticulous on the spot that you fish? SCOTT: I would say yes, but mainly on weedy lakes. There is always that sweeter spot in a spot. You may get a crack-down but that may be the light weed around the small dinner plate that is the actual sweet spot. I spend a lot of time with the leading rod at times. I think Dinton was very much like that when I fished it. I saw the holes in the weed like cones going down and you would get a drop in the weed, but that spot was in the middle and if you could get the rig on that, it would often lead to a bite. DAN: Dinton White Swan in particular is known for being a really tricky lake, would you agree? 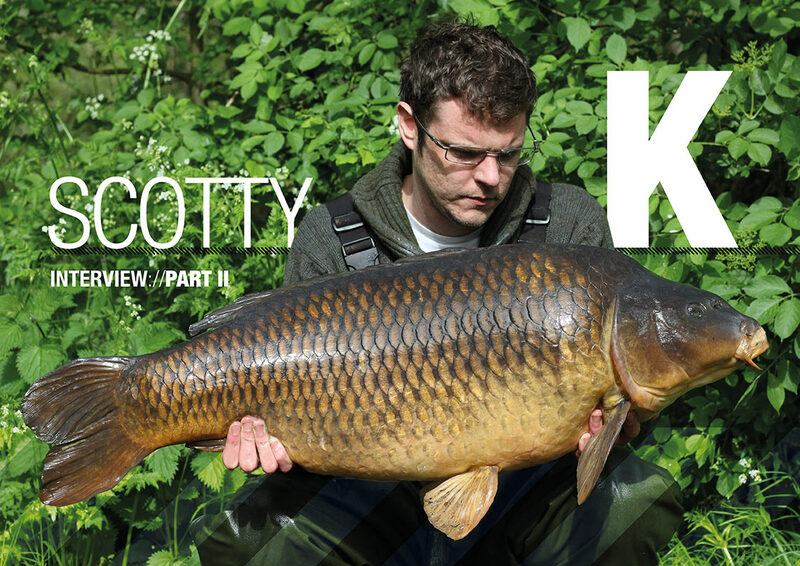 SCOTT: I would say yes, due to the amount of carp that swim in there to capture ratio, it is a tricky pit. However, I think it is more a presentation thing that them being riggy or spooky. I was always happy to make 100 casts in there to make sure I landed on that spot and quite often get a bite the next day. I don’t think that was the issue, the presentation on there had to be so right and that’s why I think so few fish seem to get caught. The fish would back off when you cast, but the weed seemed to shield the noise from the casting. Once the disturbance had finished the fish would generally creep back over the spots. 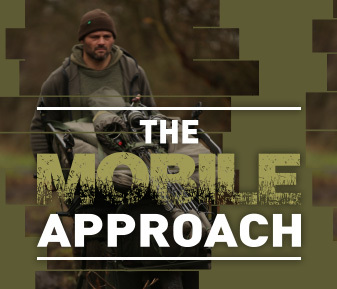 DAN: Is there still a lot of fishing for you to do in the Berkshire area or are you finding that you are beginning to look further afield? SCOTT: I am going to have to soon and I am looking forward to it. I still have some unfinished business on White Swan and there is of course Black Swan, so that could be tempting. Burghfield is up the road but I’m not sure I have the time to commit to such a challenge. I have spent a lot of time fishing busy, pressured circuit lakes and do fancy somewhere quiet. A big lake that you have your own space sounds appealing. Now I am working in the trade too, it would be nice to escape the fishing chat for the weekend I suppose, so maybe I will find somewhere like that next. 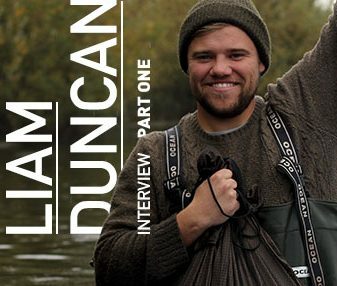 DAN: Bringing it to more recent times, you said you had a little stint on a lake that you had pre-baited. I know that was quite a success, can you expand on this? SCOTT: It is a lake that I have been walking round since 2005 I think. I knew what fish were in there and said I was going to fish it, but for one reason or another I never got round to it. When I left my previous job, I had a couple of weeks in between that and my new role, so thought I would capitalise on this time. I walked it all season on and off and the weed was savage. It was like a football pitch in areas, so I sorted out some weed rakes to make somewhere fishable. I had a swim that looked good and the fish would be often seen in the area. Soon though the weed was so bad the whole area was unfishable, so it was time to hatch another plan. I noticed the fish spending a lot of time in a whole in the weed, particularly in the wet summer weather. It was a small swim that not many people would fish and the spot was only close, so I planned to bait the area for a few weeks. I was baiting with a mixture of seeds and 12mm and a few 16mm Krill Boilies. 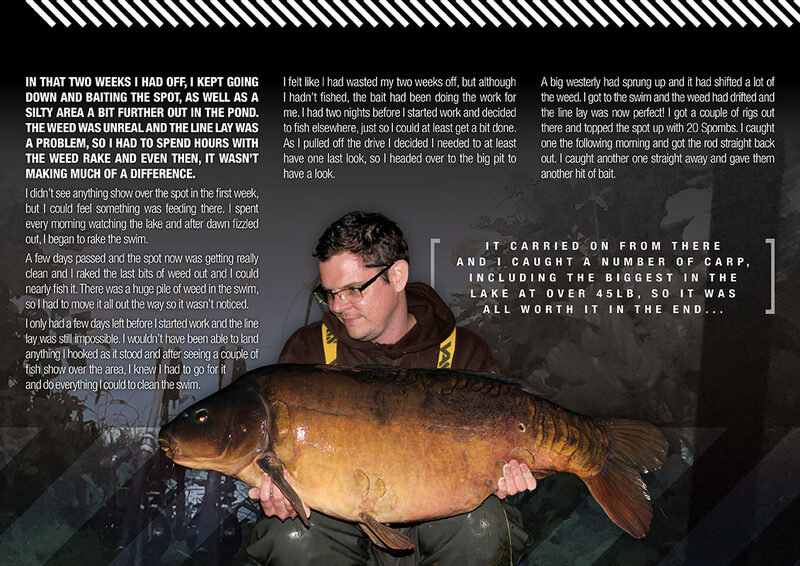 I knew from mates that had fished it in the past that they liked small baits, so most of the mix was 12mm boilies. In that two weeks I had off, I kept going down and baiting the spot, as well as a silty area a bit further out in the pond. The weed was unreal and the line lay was a problem, so I had to spend hours with the weed rake and even then, it wasn’t making much of a difference. I didn’t see anything show over the spot in the first week, but I could feel something was feeding there. I spent every morning watching the lake and after dawn fizzled out, I began to rake the swim. A few days passed and the spot now was getting really clean and I raked the last bits of weed out and I could nearly fish it. There was a huge pile of weed in the swim, so I had to move it all out the way so it wasn’t noticed. I only had a few days left before I started work and the line lay was still impossible. I wouldn’t have been able to land anything I hooked as it stood and after seeing a couple of fish show over the area, I knew I had to go for it and do everything I could to clean the swim. I felt like I had wasted my two weeks off, but although I hadn’t fished, the bait had been doing the work for me. I had two nights before I started work and decided to fish elsewhere, just so I could at least get a bit done. As I pulled off the drive I decided I needed to at least have one last look, so I headed over to the big pit to have a look.